He has earned seven million likes and millions of video views, all without a single kitten or puppy onscreen. I was scrolling through Facebook a few days ago looking at dog videos, cat videos and random political posts when I noticed something pretty incredible. A recent video of Bernie Sanders, who ran in the 2016 Presidential primaries and is a current sitting U.S. Senator, had 1,752,234 views on Facebook. Holy crud! Whatever you think of his views, you have to admit that many views on anything that is not a cute kitten/puppy/goat is really impressive -- especially when it’s a video of a 75-year-old dude talking politics. So I started wondering, how exactly does Sanders do it, and what can we learn as business owners, authors and coaches about building our own brands? As I dug into his Facebook page, I discovered five specific things that can that can help anyone build their brand effectively (especially on Facebook). On social media, video gets more shares and more engagement than anything else. And that means it gets more eyeballs. Which is, of course, the thing you really, really need to build your brand. According to Cisco, "Globally, IP video traffic will be 82 percent of all consumer internet traffic by 2020, up from 70 percent in 2015." That means that in just 2.5 years, 8 out of 10 minutes spent on the web will be spent watching videos. 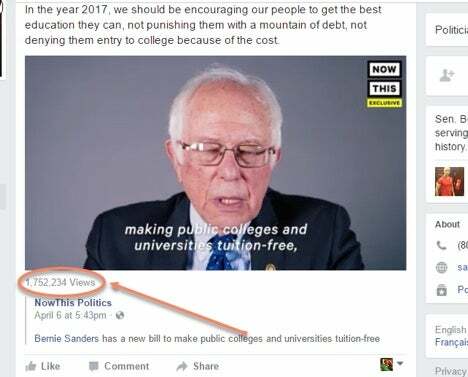 So when Sanders puts mostly videos on his Facebook page, there’s a reason for that. Videos are where most of the eyeballs are. 2. It's hip to be square. As I was looking through Sanders' page, something really stood out to me. So I talked with a couple of my other marketing guru friends, and it turns out that this is a Facebook truth -- most of the time, square videos perform better than rectangular ones. And the results are really astounding. My friend Heather, who runs about $10,000 worth of Facebook ads a month says, “square videos outperform rectangles by a two to one margin normally.” This could be because a square video takes up more room on the newsfeed, so it gets way more attention. That’s our theory at least. But whatever the reason, it works. There are a bunch of apps that let you make square videos in a snap. Here's a list. 3. Subtitles are finally cool. I’m not sure if I’m not super-sophisticated or what, but subtitles are just not my thing -- until now. If you are building a personal brand as a coach or author, and you are talking in your videos, then you must use subtitles. In Facebook land, these are called captions. Why? Because a huge percentage of Facebook video is watched without sound. The estimates I’ve seen say as much as 80 percent of videos never get their sound turned on. Luckily, if you aren’t good with fancy software, Facebook has an internal tool for captions that is really easy to use. So use it! 4. Engagement creates long term relationships. Engagement -- not the diamond ring kind, but the kind where people like you and interact with your videos -- is what keeps a relationship alive, at least on social media. Sanders is a king at this. He has a pretty simple message of “stop letting the wealthy take advantage of the average American.” But he knows that message resonates with his “tribe” and he repeats that message in different ways over and over and over again. So as you're building your own brand, you'll want to experiment with different messages until you find one that gets a lot of interaction and engagement. Once you do that, stick to your core theme with variations. You won’t believe how well this works. 5. No fancy pants needed. The other day, a friend of mine posted a video on Facebook from 1989. She made it in a high school video editing class with thousands of dollars of equipment, and it was awful compared to today’s smartphone videos. That goes to show you don’t need a ton of equipment to make a great video. Usually, all you need is a smartphone and tripod or selfie stick. That's it. The fancier you get, the longer it will take you to get online. So keep it simple. Take a look at Sanders' videos, whether you agree with his politics or not. You’ll notice a theme. It’s mostly Sanders talking to a camera. These videos are dead simple. He doesn’t even seem to comb his hair! So don’t let a lack of fancy equipment stop you because there are no fancy pants needed. When creating engagement and fans on social media, there is no doubt that Sanders can teach us all a few things. Luckily, these lessons are easy to implement and get benefits from fast. So get your first video up today, and see what happens. I think you’ll be pleasantly surprised.